Whether you drink or not, you can still experience hangovers as a result of overdoing just about anything. The exact definition of a hangover is 'headache and other after-effects caused by consuming [alcohol] in excess'; but i think this situation arises from over-indulgence in many things. I for one have definitely experienced my fair share of sugar hangovers, dairy hangovers and even caffeine hangovers. The truth is, once theres too much of something our body doesn't exactly need circulating our bloodstream, it is our body's sole focus to get rid of it, and whilst it flushes out what it doesn't need, several other systems in the body shut down, and this is where we begin to experience a feeling of unwellness. Whatever it is you're hungover from, this tonic is the ultimate system flusher [for want of a better phrase] and it assists the body's natural responses and efforts to neutralise the bloodstream and to get the body back to a state of homeostasis. Turmeric and ginger are powerfully cleansing and detoxifying, whilst oranges, I'm sure you all know, are high in vitamin C - great for boosting the immune system. The inclusion of a citrus fruit like lemon or lime also helps to neutralise the level of acidity in the body, and getting all of these benefits in liquid-form means they're far more easily available and can be absorbed and utilised more efficiently than if you were to eat these ingredients whole. Start by 'juicing' the ginger. Chop it into smaller pieces and place it in a high speed blender with the turmeric and water. Blend on the highest speed for 1 minute, and then pour through a fine sieve or a nut milk / jelly bag over a small bowl or a jug, to remove the pulp. Rinse the blender then return the ginger and turmeric juice back into it. Juice the oranges by slicing them in half width ways through the middle and twisting them on a glass or plastic hand-held citrus squeezer. Pour into the blender as you work through the oranges, then do the same with the lemon and add that to the blender too. Add the ice and blend for a final time until smooth. So, although it's practically sunbathing weather compared to most Decembers in the UK, winter is coming, and more importantly, (in the words of Coca Cola) the holidays are coming. Silently, alongside public Christmas light displays, Starbucks' red cups and pumpkins and chestnuts filling my local grocery store, winter is unfolding and I have an underlying suspicion that it's just gonna come out of nowhere and hit me in the face with blue lips, frozen toes (no matter how strong my sock game), and some seasonal illness for good measure. My response will be these seasonal brownie bites, inspired by the abundance of chestnuts this time of year - definitely not one of those ingredients you come across in a recipe that makes you think 'where on earth?!'. These brownie bites are perfect as a sugar-free snack with full-on chocolate vibes during the winter, and would be well received making an appearance at duvet days, movie nights, cocktail or dinner parties, wrapped as a gift to give or kept in the freezer when the boxes of Celebrations and balls of Chocolate Orange begin to get a bit much. 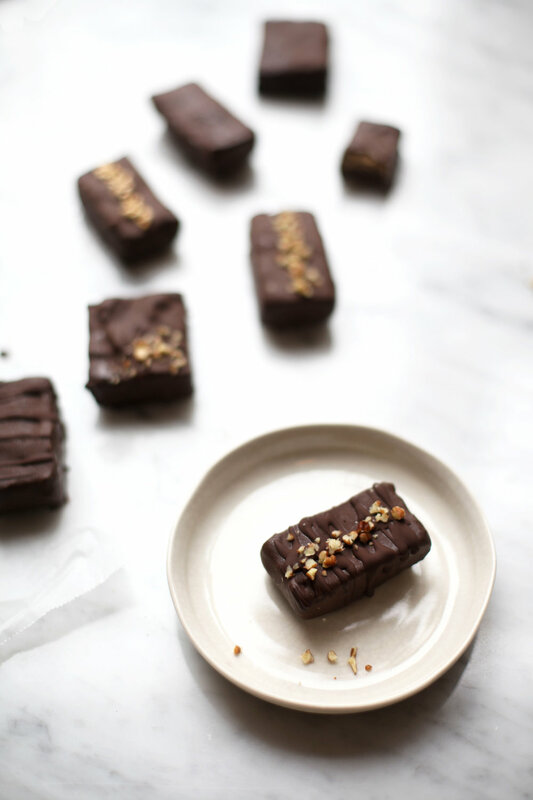 + Can also use store-bought dark or raw chocolate bars. I like Ombar. Start by making the brownie layer. place the almonds, walnuts and chia seeds into a food processor and blend until they form a flour like consistency, similar to breadcrumbs. next, add the chestnuts and blend again for 30 seconds. then add the dates, cacao powder, coconut oil, himalayan pink salt and coconut sugar, if using. blend for 30 seconds to 1 minute, until the mixture comes together to in a slightly sticky dough-like consistency. make sure the mixture is smooth and that there are no large chunks of nuts involved, as this recipe tastes so much better when the mixture is completely smooth. Once blended, either place into a cupcake or mini loaf tin tray (i use this one) or into a standard loaf tin or baking tray (around 9 x 5 in). Using trays with individual mini sections will be easier to handle, but you can use a larger tray and simply cut into individual pieces once set. Whichever you use, spread the mixture on the bottom of the tray/tray sections, making it about 1 to 1.5 cm in height. Place in the freezer to set. Whilst the brownie layer sets, make the chestnut caramel layer. In a cleaned food processor or your blender, pulse the chestnuts for 20 seconds until they begin to break down into small pieces. Add the dates, almond butter or tahini, coconut oil, vanilla, syrup of choice and maca, if using and then continue to blend until smooth - about 1-2 minutes should do it. Once the bottom layer is beginning to set and firm to touch, spread the chestnut caramel layer on top until the entire base is covered. Smooth evenly to ensure a more level finish to coat with the raw chocolate. Return to the freezer and set for about 1-2 hours, or overnight. Unfortunately this step is necessary in order to easily coat the brownies in the chocolate layer. If you can't wait, follow the following step for drizzling the melted chocolate over the bars instead of dipping the bars into it. Once set, start making the chocolate. Leave the brownies in the freezer until you have made the chocolate. bring a small pan of water to the boil and then set a heatproof bowl over the top. Add the cacao powder, cacao butter or coconut oil (or combination of both), salt and sweetener of choice to the bowl and whisk as the mixture melts together. Once combined, remove from the heat but leave the bowl over the water to avoid the chocolate cooling and thickening too quickly. Remove the brownies from the freezer and remove from the tins carefully with a knife or cake slice. If you used a large dish, slice into desired sizes. Set each individual brownie onto a cooling rack with a layer of baking paper on the surface underneath the rack. One by one, add a brownie to the chocolate mixture and, working quickly, use a fork to turn the brownies through the mixture until fully coated. *You could alternatively keep the brownies on the rack and pour or spread the chocolate mixture over them, but I find this method a little messier. Sprinkle each one with chopped pecans or hazelnuts, Qnola or himalayan pink salt before the chocolate has fully set. 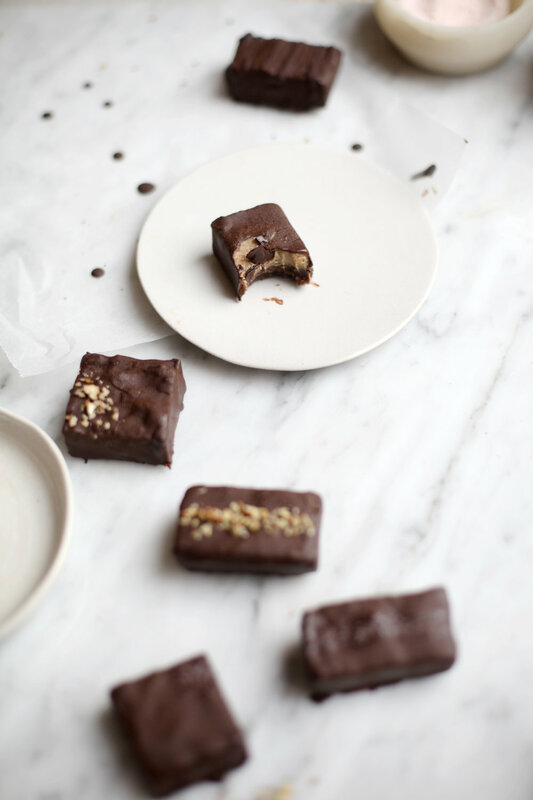 You can also experiment with drizzling a second layer of chocolate over the smooth chocolate layer, and if you have leftover chocolate you could double dip, for a thicker, crunchier outer coating. If the cooling rack fits, place it in your fridge or freezer once each brownie has been coated. If it doesn't fit, wait for the chocolate to set slightly at room temperature, and then transfer the brownies onto smaller plates or to tuppaware. + store in the freezer, and remove 5 minutes before serving. Winter is hard enough without having to deal with dry, sensitive skin. As a model, I lack confidence incredibly if my skin is in bad condition. I don't like going to castings and I feel bad for the make up artists on shoots who have to deal with it! My beauty regime has always been pretty low maintenance and i don’t have a lot of products - i stick to what i know, and more importantly what my skin knows. In the winter though, I’m forced to step it up a little as i suffer from sensitive skin which, depending on the weather, can become dry, irritated and sore. I find that using loads of products in a frantic attempt to sooth it just makes things worse, clogging pores and causing blemishes, so I keep it simple by using only a select few of my favourite products. I use products made from natural, ethically sourced ingredients as much as possible. For moisturisers, I like thick, oil-based formulas, but ones that don’t leave a greasy residue. Make up wise this time of year, I only wear make up if i’m going out, or if i have meetings. I try to keep my skin completely clean if i’m just working and know i’m not going to leave the studio much. 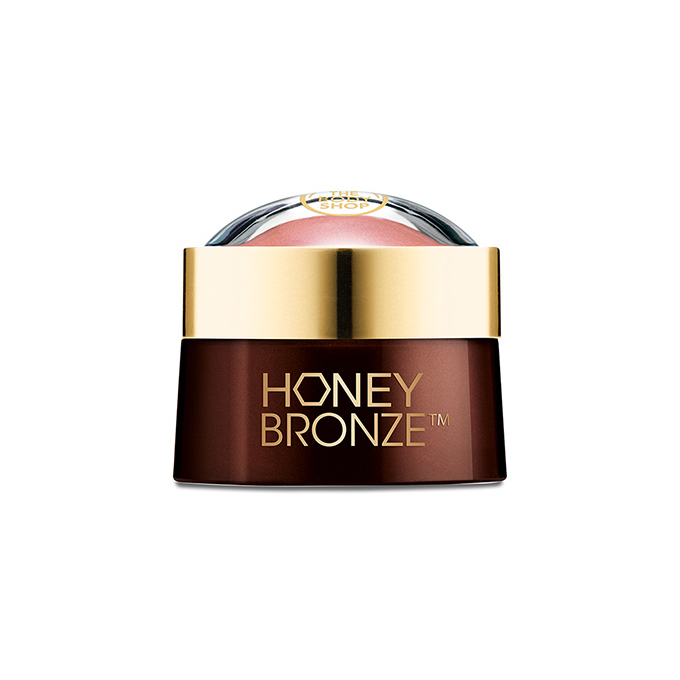 When I do, I prioritise face products to enhance my complexion and to create a healthy glow. A healthy diet is just as important as cosmetics when it comes to obtaining and maintaining radiant, healthy looking skin, but above are my beauty best friends. Say hello. Dry Body Brush | Herbivore Organics Coconut Bath Soak | Apotheke Charcoal Body Lotion | The Body Shop Honey Bronze Highlighter | Bare Minerals Active Cell Renewal Night Serum | Aesop Purifying Facial Cream Cleanser | Dr Hauschka Rose Day Cream. The Winter Solstice - the shortest day of sunlight and the longest night of the year - occurs at 4.49am on December 22nd this year. The term 'solstice' derives from the Latin word 'solstitium', which means 'Sun standing still'. The day after Winter solstice marks the beginning of lengthening days, leading up to the summer solstice in June. To celebrate elongated and (hopefully) brighter days, a friend and I have organised an offering of medicinal lattes, tea infusions and a candlelit meditation, followed by a sharing style, bring-a-bowl floor feast for our closest friends, friends of friends and family members. We wanted to bring people together at this busy time of year, where stresses can overpower and disrupt living in the moment at a time that’s supposed to be joyful. Often, as the year comes to an end, panic kicks in about not having achieved enough in the last 365 days, whilst what we should really be focussing on is all that we have accomplished. I’m looking forward to sharing this special moment in our annual cycle with new and old acquaintances, without any sense of time or urgency. In MT Wolf’s song, Burgs, the speaker points out that when we entered this world, we did so with great awe and such wonder. We arrived wondering what it was all about and what our time here was going to be like, but as we became comfortable, we began to wonder more about ourselves - our jobs, our to do lists - forgetting what we came here for. The chance to be here happens briefly, so spend more time taking it in, as well as the people here with you, and enjoying your time here, rather than stressing about it. I’ve been adding medicinal mushrooms (not as illegal as they sound) to my food and drink for years now. They bring a powerful energy and interesting flavour to things like smoothies, lattes, porridge and savoury meals. They combine with other ingredients to enhance their nutritional benefits. In this recipe I use chaga, which is an adaptogen containing deeply cleansing antioxidants. 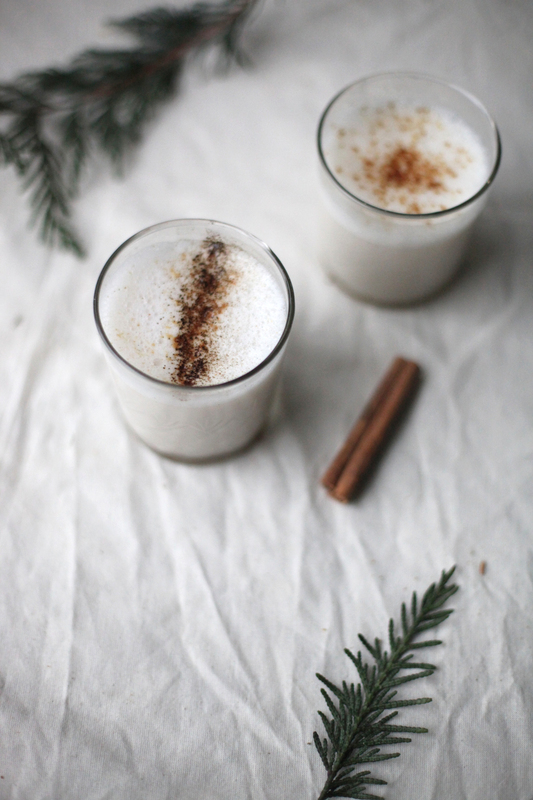 As an adaptogen, it can help to alleviate stressful feelings and anxiety by balancing the body’s various systems, energizing systems that are fatigued, and quieting those that are overactive. Combined with healthy fats and protein provided by the almond milk, this makes the perfect evening remedy to sooth the soul, calm the mind, and encourage good quality rest. Set the almond milk in a small saucepan over a low to medium heat. Add the vanilla, ginger, cardamom pods and cinnamon sticks and heat, stirring constantly, for 10-20 minutes. The longer you simmer, the more the flavours from the spices with infuse the milk. Add the honey towards the end if you want to add some sweetness, then whisk with a hand whisk or an electric whisk (I use this one) to create a frothy texture. This isn't essential, but it is nice. Remove from the heat, transfer to glasses or mugs and serve warm or enjoy chilled over ice. I recently discovered that I love red grapes. I don’t eat much fruit, which, before I ate healthily would have been a shameful confession, but which now is more a way of life I am neither proud nor ashamed of, and which is a natural progression of a low sugar diet. Although grapes are available all year round thanks to global farming and other agricultural plus's, I feel like at the moment they everywhere. Maybe I’m just noticing them more since I ate almost an entire bag of them on a road trip to upstate New York. Since then, grapes went from being something I never particularly fancied in my lunch box at school, to something I had great plans for. Before now, grapes were just something I was told to eat by my mother as they were good for me, and as one of few things that fell into this category that I actually enjoyed eating, I obeyed. However, I’ve never found them very exciting, and since making my own grocery store decisions, would always choose berries or other fruits over grapes. As a child, freezing grapes was about as experimental as it got (seriously tho, try it). We never cooked them or added them to meals, rarely added them to baked goods or made desserts with them, and definitely never thought about making them into refreshments. Grapes were grapes. Easy, instant, ready to eat. No hassle. But I’ve completely complicated things since rekindling my love for them. Let me introduce you to, roasted grapes. I’ve been roasting bunches and bunches of em since I returned from New York, and I want the world to know that until you roast a grape, you haven’t given it a proper chance in life. And until you make a crumble out of roasted grapes, you haven’t given yourself a proper chance in life. Start by cooking the fruit. Preheat the oven to 200c. Arrange the grapes, oranges and dried fruit, if using, in an oven proof dish and drizzle with the lemon juice. Pierce and roughly mash the grapes using a fork and then place in the oven for 45 minutes. Stir a couple of times to evenly cook the grapes, and after 30 minutes, drain the juices. Save in a jug as the juice makes an instant and delicious sauce to serve with the crumble (and other desserts). Whilst the fruits cook and begin to soften, make the topping. Blend the walnuts and desiccated coconut together in a food processor, on the highest speed, until they form a rough flour. Transfer into a medium mixing bowl and add the buckwheat flour (or oats or buckwheat flakes, if using), ground almonds, coconut palm sugar, salt, cinnamon, cardamom and flaked almonds or chopped nuts. (Ground cardamom is sometimes quite hard to find, but this recipe will work perfectly well without the spices - they are just there to add flavour). Stir to combine, then add the coconut oil, breaking it up into small pieces and rubbing it into the dry ingredients with your hands. Massage gently until everything is combined and the mixture resembles dough-like breadcrumbs. Remove the fruit from the oven once it has softened and reduced a little. This is the time to stir in the chia seeds, along with any other superfood powders, coconut milk or almond butter, if using. 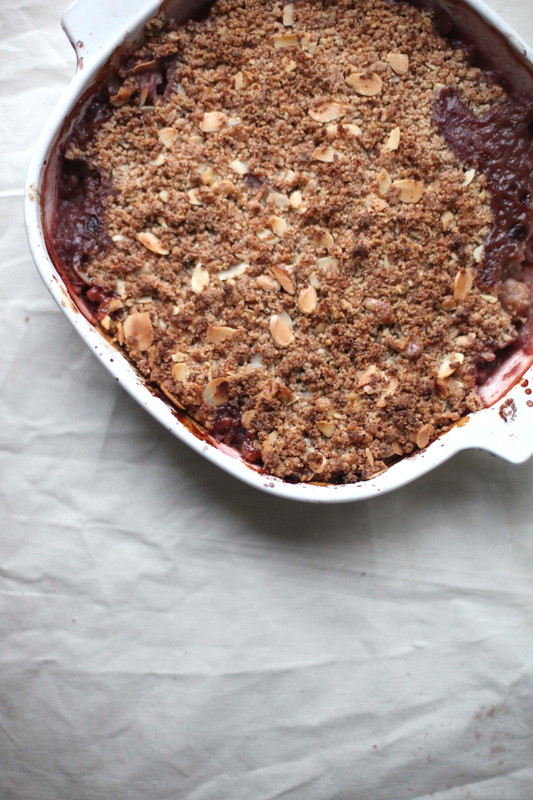 Then arrange the crumble layer, evenly spreading out spoonfuls of the mixture to cover the fruit completely. Press down gently with the back of a spoon or a spatula to make the crumble compact, as this will encourage it to bind and crisp up nicely. Return to the oven and cook for a further 30 minutes, until the topping is brown and becoming crispy, and the fruit layer is bubbling and jam-like. Top with extra walnuts, flaked almonds or other nuts and serve with probiotic yoghurt, coconut yoghurt, coconut milk, almond milk, cashew cream, cashew custard, the preserved juices from the grapes, almond butter, tahini, cacao powder, fresh basil, mint or thyme, grated raw chocolate or grated orange zest. Get creative. The holiday season – a joyous time, but one that has become potentially more stressful than I’m sure it was ever intended to be. If you’re not stressing about presents, sending cards, food shopping, prepping, cooking or where everyone is going to sit and oh god they need somewhere to sleep too, the chances are you’ll be one uncontrollable step ahead of yourself stressing about the aftermath. The tiredness, the mess, how many ways you can disguise the leftovers and how long its acceptable to keep eating them for, and on top of all that, the way you’re going to feel after days and days and days of eating. If you stick to quite specific dietary requirements / choices and are worried about keeping in practice during the holidays, do your best to create a nourishing balance that isn't too structured and that you can enjoy, rather than completely depriving yourself of the foods on the table that you wouldn't usually eat. As soon as you make any rules and decide that you're not under any circumstances allowed even a taste of something you know you want, you turn into a maniac. And when everyone else around you is enjoying the things you want, you tend to become a hot mess of hostility and frustration, unable to focus on anything other than the smell, taste and texture of the very thing you're trying to avoid. So you have that little taste you disallowed yourself and since you tasted it you now have to finish it, and since you've finished one then the damage is done and you may as well have a few more, right? When you make rules, you end up eating a lot more of what you don't really want than if you'd focussed your attention elsewhere. Think about it this way: if you drop your phone and it smashes a little, you don't continue to smash it more and more just because the damage is already done. During the holidays, if you do indulge in something you'd usually steer clear of, enjoy it but don't let it turn into some kind of binge. One way to create a balance is to ensure healthier options are in sight too. Although it is hard to interfere with traditional recipes during the holidays, be bold with offering a healthier take on some conventional dishes and get involved. You'll be able to control a few contributions, meaning, if you want to, you can bulk your plate up with these, or you can simply enjoy a bit of everything. This, my friends, is balance. When we indulge, many of us treat it as a 'now or never' kind of opportunity. But instead of eating to the point of discomfort, enjoy what you want, when you want it, and rest assured that the opportunity to indulge isn't 'now or never', but is actually 'now, or tomorrow, or the next day'. There will always be leftovers, so focus on enjoying the meal, and more importantly the company, without getting hung up on how to construct your plate. Try to make one meal a day - preferably breakfast or an evening snack - centred completely around fresh, natural ingredients. This way you can ensure your nutrient levels are high and there are plenty of healthy enzymes present to detoxify your body, meaning you can still enjoy the standard holiday fare knowing you won't feel too terrible afterwards. Having something light like a salad or a juice between indulging should help to counter any discomfort you may experience from eating foods you're body is no longer familiar with. During the holidays, your phone stops being a vital part of your existence, and starts being some kind of technological Grinch. Unless you’re spreading Christmas cheer via whats app, looking up recipes or digitally capturing the best moments of the celebrations, use the time you’d usually spend ‘online’ having real conversations with real people and doing things you don’t always have the chance to see or do. Growing up, although constantly active, I dreaded Boxing Day walks as soon as Christmas Eve arrived. Now, perhaps since relocating to a bigger city, I cannot wait to get out into the fresh air and wonder aimlessly across the vast and chilly fields. During the holidays I don’t go to the gym but instead make time to do some gentle body weight workouts or yoga routines in my bedroom, if I feel restless. To aid digestion, circulation and to keep your body feeling fit, take a little time each day to stretch, walk or run – for meditative purposes as much as for fitness. It also helps to get family or friends involved so you don't miss out on the real fun. Try suggesting a new tradition like a pre christmas dinner walk or a gentle evening stretch down in front of a favourite christmas movie. This way you'll work up a healthy appetite and keep your body from shutting down completely as you begin to relax. Exercise also release endorphins and helps calm and settle the mind, so if there's a stressed host/ess in the family, it will do them (and everyone around them) the world of good. It’s okay to take it easy. If your main concern is not having enough healthy options at Christmas, my best advice is to stock your kitchen so that there will always be something nourishing for you to snack on. Whether you want raw chocolate on hand so you don’t end up eating the more processed alternatives, or whether you want superfoods on hand to ensure you have an easy, instant route to vital vitamins and minerals, making room for your favourite pantry staples in the kitchen, or in your luggage if you are travelling, is a simple step for a balanced holiday. The holidays tend to free up a lot of time if and when you’re not working so much. Take up a new or temporary hobby that requires you to utilize a different part of your brain or exercise a different skill. Spending time on something new can open you up to things you may never have known you enjoyed had you stuck to your usual routine. It doesn’t have to be educational or especially enriching. Maybe learn a language, lose yourself in some terrible television, read a new book, do some art or discover some new music. As we near the end of another year, take time to reflect on all of the days you had in 2015, and learn to acknowledge and appreciate your achievements. I personally find it hard to naturally praise myself if and when I achieve something, as there is always something else on my to-do list and I never schedule in time to celebrate. I often end up realizing what an achievement something is when one of my friends or family bring it up and I’m like, “oh yeah, that, yeah I guess that is a pretty big deal”. Once you’ve concentrated on what you’ve accomplished in days gone by, you’ll find it easier to formulate new ideas and set intentions for the days to come. General winter wellness tips. I arrived in New York October 23rd. People were already in fancy dress. People's dogs were already in fancy dress. Halloween in the USA is no joke. It is real. Settled into my friends apartment in East Village. Ate at Dimes too many times. Ate at Hu Kitchen too many times. Saw too many dogs dressed in tutu's. Said Hola to my agents, had new digitals taken and began a marathon of castings. Regretted bringing so many jumpers because the weather here is currently tropical. Said goodbye to my laptop as my flatmate bathed it in lemon and ginger tea. 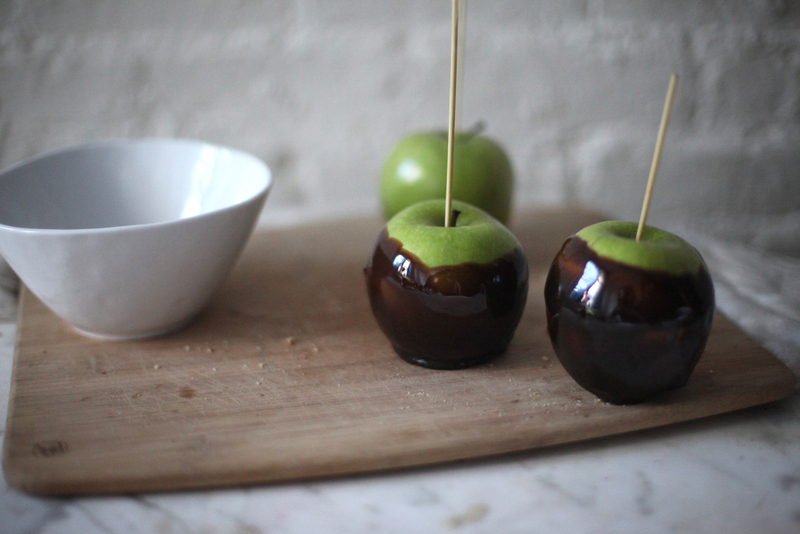 Was forced to take a break from my usual work, so between castings and meetings, made some healthy toffee apples. + You will need a selection of bamboo sticks, kebab sticks or lollipop sticks. Start by boiling the water in a medium saucepan. As it begins to boil, stir in the coconut palm sugar, and let the mixture boil on a high heat for 2-3 more minutes, until the sugar has dissolved. Reduce to a medium heat, then stir in the remaining ingredients. Simmer here for 10-12 minutes, stirring constantly as it can stick to the pan or burn easily. Keep a close eye on it, watching it thicken, and continue to simmer until it becomes darker brown in colour, thicker and begins to reduce slightly. To test whether it is done, take a teaspoonful and rest it on a plate to cool. As it cools it should become even thicker and should be slightly tough to touch. If it is still sticky and runny, continue to simmer and allow it to thicken even more. Once you are happy with the consistency and once it begins to set more solidly, remove the pan from the heat. Now you need to work relatively quickly as the toffee will cool rapidly. Lightly grease a plate or a baking tray with coconut oil. Take one apple at a time and insert whichever sticks you are using through the middle of it. It shouldn't go all the way through to the other side, but deep enough to ensure it won't slip out. Now, carefully tilt the sauce pan to one side, dip the apple into the toffee mixture, and turn the apple repeatedly to coat it evenly. Lift it out of the toffee and continue to turn it above the mixture, to let any excess drip off. I recommend scraping the bottom gently, to ensure it doesn't stick too much to the plate/tray that you place them on. As the toffee begins to stop dripping, place the apple on your prepare surface, and repeat with the other apples. You can either leave the apples bare like this, or roll them through the toppings of your choice. I chopped some salted almonds finely and placed them in a medium bowl, then gently rolled the apples around in the bowl until the almond dust stuck. If it is easier, you can top the apples by taking a handful of your toppings and pressing it into the toffee coating. Once coated, or if you are leaving them bare, place the apples in the fridge to cool and set a little more, for around 1 hour. The longer you leave them, the better. + These will last for around 2 weeks in the fridge or in an airtight container. 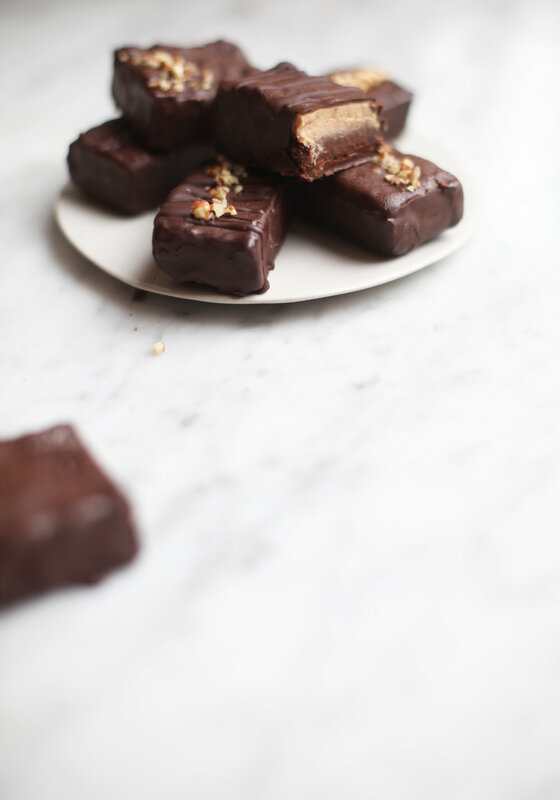 + You can also use this toffee recipe to make individual toffees. Instead of coating apples, simply allow the toffee to cool a little, and then take teaspoonfuls of the mixture and mould it into individual shapes, or fill chocolate moulds with the mixture, and set in the fridge. Since changing my diet and cutting out wheat, gluten, grains, and any heavily processed carbohydrates, I've been surprised at how little I have missed certain things I thought I would struggle horrendously without. I always loved pizza. I always, always loved carbonara. Needless to say, I've always been fond of cheese. And I even went through a phase where I'd get home from school and make a huge bowl of pasta with cheese and baked beans, as a snack. A pre-dinner before my dinner. So to say goodbye to my favourite Italian dishes seemed a crying shame, but I soon became more excited by making spaghetti out of vegetables, and pestos and sauces out of natural ingredients. 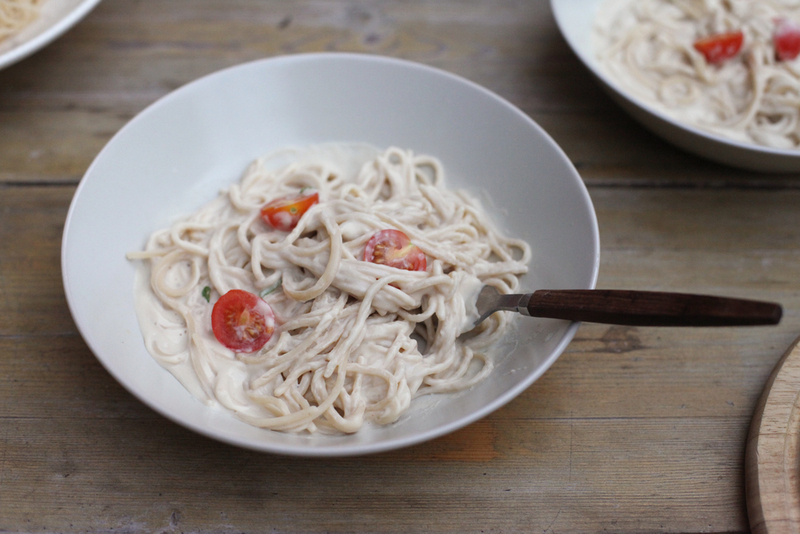 This recipe is a cut above all other veggie pasta dishes, and tastes so much more like the real thing, and in my opinion, so much better than it, too. It all began when I was in the kitchen making an insanely good soup, surrounded by brilliant ingredients all not really knowing what they were there for, what they were doing or where they were gonna end up. If ever a vegetable or a legume could look unsure of itself, it was at this moment, in my kitchen. The ingredients were not familiar with one other, and no one was feeling confident about how their time spent together was going to end up, but something happened in that blender that should have happened a long, long time ago. 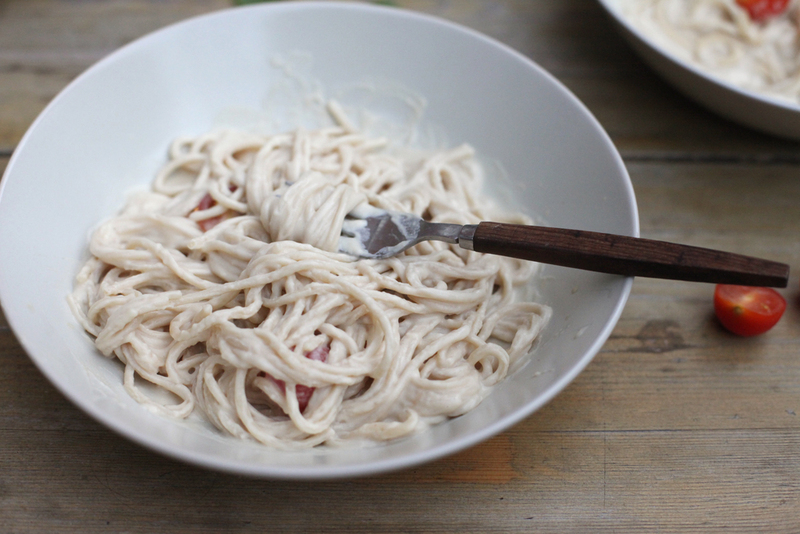 I've made carbonara sauce before, but I wanted to make a new version without using coconut or nuts - as I find coconut milk can be quite rich sometimes, and I've also been trying to reduce the amount of nuts I eat recently, because I went a bit overboard for a while. The beans in this recipe make it a good source of protein, and the lack of thick, processed cream or real cheese make it lower in bad fats and completely free from dairy, unlike most shop bought sauces and conventional recipes. 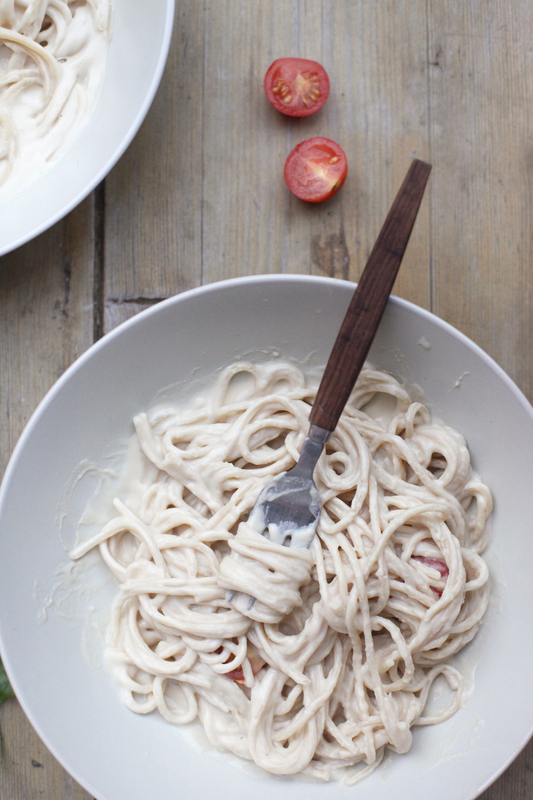 The beans, combined with the oil and water, create a wholesome, flavoursome creaminess, even tastier than what would be achieved with real cream, and the nutritional yeast creates a mild cheesy flavour - essential in any pasta dish. 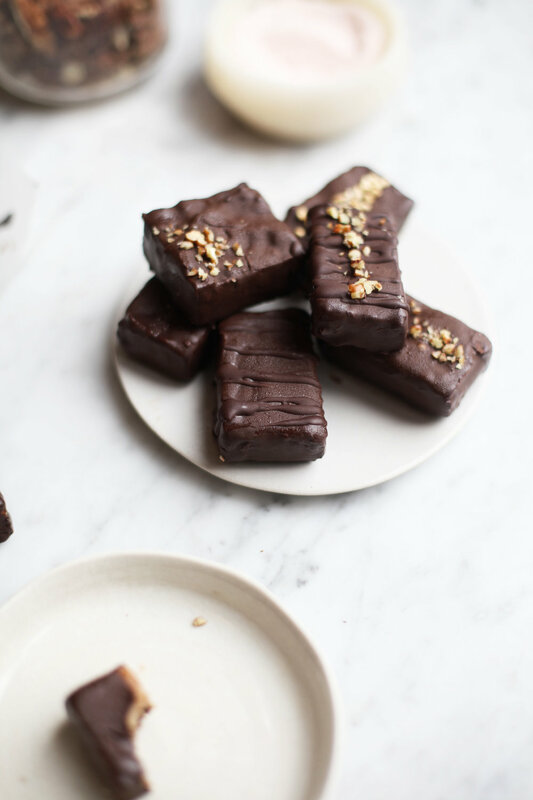 This recipe is entirely gluten free, dairy free, sugar free, grain free, nut free, vegan and vegetarian. You can enjoy it plain (pictured above), with fresh herbs, or with your own choice of vegetables, meat, fish or seafood. + You can also omit the pasta entirely, and enjoy the sauce on its own as a simple White Bean Soup, served hot or cold as a gazpacho. Start by blending together the beans, olive oil, water, nutritional yeast and salt. Blend for 2-3 minutes on the highest speed your blender can reach. Meanwhile, bring a medium pan of water to the boil and, once boiling, add your spaghetti or whichever type of pasta you are using. 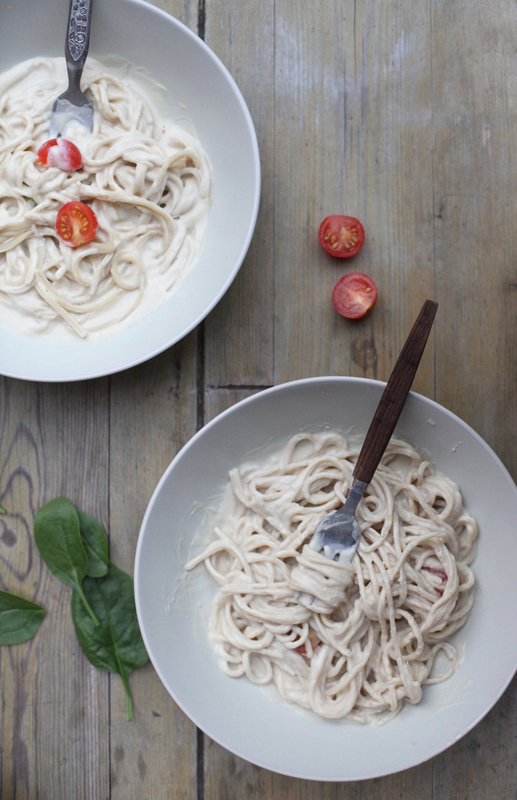 Add a little salt and a dash of olive or coconut oil to reduce the risk of the pasta sticking together (this can be quite common with gluten free pasta's, depending on which alternative you go for). Once the sauce is blended and has become a smooth consistency, taste it to check you are happy with the flavour and texture. Add more nutritional yeast if you want it slightly cheesier, more salt (and pepper) to season, more water if you want a thinner sauce, and any extras from the Optional section of the ingredients list. (If you want to add bacon, don't blend this into the sauce. Simply fry or grill the bacon, cut into small pieces and set aside to stir through the pasta, once it is cooked). When you are happy with your sauce, and when the pasta is cooked, drain the pasta, return it to the pan and stir through the sauce. At this point, add your bacon or any other toppings of your choice. Heat through for a couple of minutes then serve. Finish with a little extra olive oil, a sprinkling of salt and a drizzle of fresh lemon juice. + You can also use the sauce recipe as an alternative to cheese sauce, which you can use in a healthier lasagne or pasta bake. This is a bold statement to make but i'm going to go ahead with it anyway. This, my dear friends, is better than pasta. Maybe, dare i say it, even better than courgetti. + Can also use this brazil nut cheese recipe for the sauce. Start by preparing the sauce. Heat the olive oil in a pan and add the salt, pepper and garlic. Sauté for 1-2 minutes before adding all of the remaining ingredients. 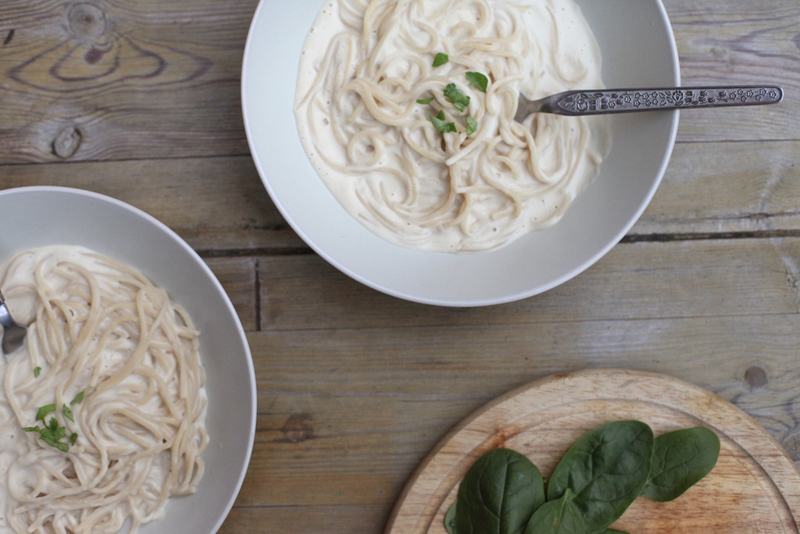 Simmer over a very low heat whilst you turn your attention to the celeriac tagliatelle. Cut the earthy, soily and bumpy outer edges of the celeriac off and discard of them. Cut the celeriac in half if it is large, or slot the entire thing into your spiraliser. + If you don't have a spiraliser (you should) use a julienne peeler, or a normal peeler to make fatter, flatter pasta ribbons. When the celeriac is all spirallised, add it to a pan of water and steam for a few minutes to soften it. Keep an eye on the sauce, stirring constantly and adding water if it is thickening or sticking to the pan. 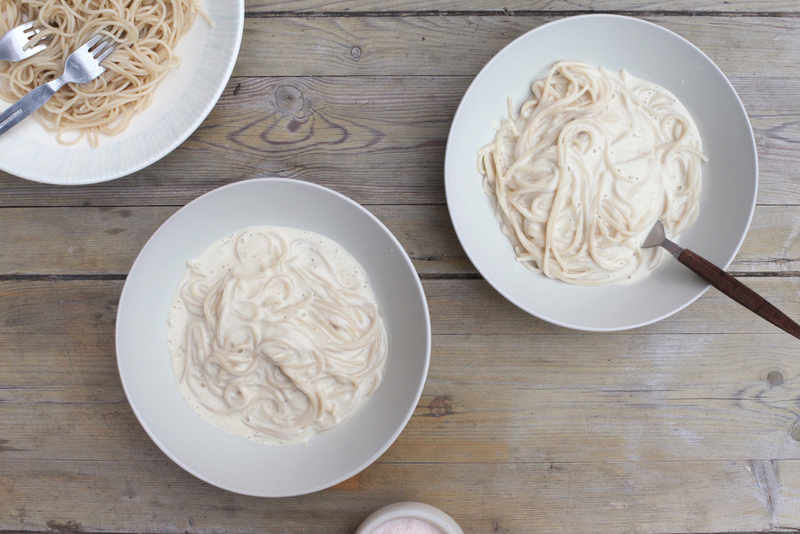 Add the chopped chestnuts and stir through, then either arrange the celeriac tagliatelle across the number of bowls you have to serve, and pour the sauce equally over each portion, or add the sauce to the saucepan and stir it through the celeriac pasta before serving. Garnish with fresh herbs, nutritional yeast and a drizzle of olive or truffle oil. An incredible recipe for the perfect gluten, grain, dairy and sugar free mince pies. This recipe uses the most amazing gluten and dairy free pastry I have ever made, and the filling is a unique caramelly take on traditional mince meat. I was never a fan of mince pies growing up and always hated sultanas or currents in anything, picking them out excruciatingly from anything I found them in. This recipe doesn’t use conventional, high sugar dried fruits, but instead combines antioxidant rich super foods such as goji berries and dates with fresh blueberries. The dates make the texture of the filling incredibly caramelly, and the berries release a delicious flavour into the mixture which is absorbed by all of the other fruits as they cook. + Get ahead of yourself and make the dough now, which you can freeze or which will last in the fridge for a couple of days before you need to cook it. Preheat the oven to 160c. Grease a muffin tin with a little coconut oil. For the crust, place all of the ingredients but only half of the flour at this point, into a food processor or high speed blender. (To melt the bar of creamed coconut, simply fill a bowl with boiling water and place the sealed bar inside. Let it sit until the water has cooled enough for you to put your hands in it and then massage the bar to quicken up the melting process. Once melted, snip the corner with some scissors and measure out two tablespoons). If using a blender, add the wet ingredients first so the flour doesn’t clump around the blade, and blend on a high speed for 20-30 seconds. If the mixture isn’t completely smooth this doesn’t matter, just make sure the coconut oil is more or less combined. Transfer to a bowl and continue to mix the mixture, adding the remaining flour, until it is completely combined. Add a little more flour if it seems too sticky and wet, or a little more agave if it is too dry. Knead and fold the dough over itself on a floured surface, using the warmth of your hands to melt any small lumps of coconut oil that might remain. Roll the dough out until it is about 3mm thick. This pastry is easiest to work with freshly made and warmer rather than colder, so there is no need to store it in the fridge. The pastry is also a slightly unusual texture, both dry and doughy at the same time, so i find the best way to roll it out without it crumbling/breaking/sticking to the surface is to press down with the rolling pin, rather than just rolling and dragging. Work with it gently. Use a round cookie cutter to make you individual crusts, and use a thin, wide, sharp knife to separate the dough discs if they have become slightly stuck to the surface. Lay each circle into the muffin tin. Leave the leftover dough for the toppings. Bake for 6-8 minutes until the crusts begin to brown, but aren’t cooked through. Whilst they cook, prepare the filling. For the filling, simply place all of the ingredients apart from the chia seeds into a medium saucepan on a low-medium heat. Stir constantly and burst the blueberries with the back of a wooden spoon. Simmer for 20-30 minutes, and add the chia seeds just before you take the mixture off of the heat. Take a tablespoon and fill each pre-baked crust. Roll out the remainder of your dough and use a cookie cutter (a star, a christmas tree or holly leaves work well but you can use a round one to make a sealed pie). Take each shape and arrange it on top of the mince mixture. Return to the oven and bake for a further 10-12 minutes, until the pastry is turning a golden brown. To serve, dust with buckwheat flour or ground desiccated coconut, and serve with coconut cream, runny almond cream or with an extra dollop of mince meat if you have some left over. Simply blend the almonds and water together on a high speed for 2-3 minutes, until smooth. Pour the mixture through a fine sieve or, even better if you have one, through a nut milk bag or jam strainer. Return the strained mixture to the blender and add your flavours or sweetener of choice, if using. If the mixture is too thick for you, add a little more water to thin it. Blend again and then transfer to a serving jug. Pour over warm or cold puddings, over your breakfast or even into savoury dishes. As kids, you don’t tend to drink much tea or coffee (unless you are my cousin who used to drink milky tea from the age she could use a beaker). In cafes, you always go for the juice, the soft drink, the milkshake or, if you’d been really good, a hot chocolate. Hot chocolate was something i never became addicted to. I craved the smell now and again, and the whipped cream and marshmallows on top, but once they were gone and the drink began to cool, I soon lost interest. There are a number of factors to think about when ordering a hot chocolate, or things can turn out terribly wrong. Is it made with milk or water? Is it made with powder or real chocolate (i.e. is there going to be a soggy clump of chocolate powder at the bottom of my cup)? DOES IT COME WITH CREAM? Even as a child i preferred to make my own. I loved making them at home with my mum and my sisters, my tiny heart skipping a beat if my mother answered “yes” to “did you buy baby marshmallows?”. Pour the milk and water into a medium saucepan. Stir on a medium heat until it begins to simmer gently, then whisk in the cacao powder, tahini or nut butter, maca, agave, coconut oil, salt and your choice of herbs and spices. If you are using creamed coconut, place the sealed bar in a bowl of boiling water for 5-8 minutes, to melt it before adding it to the pan. If you are using fresh herbs, chill flakes or cinnamon sticks, simmer for 15 minutes and sieve the mixture before serving, to separate them. When the cacao and tahini (or nut butter) have dissolved, remove from the heat and serve. Top with homemade coconut cream. Simply add all of the ingredients to a blender and blend until smooth - this will only take a few seconds. Transfer into a jar or container and set in the fridge for 1-2 hours until ready to serve. + It is best for make this in advance and store it in the fridge. However, you can spoon the mixture straight into the drink too, as it will all melt together in the end. This recipe came about as I frantically cleared my fridge before going home for the Christmas holidays. I had just co-hosted F.east - a supper club/film club which myself and my friend kicked off with a festive theme, so my fridge was chocka full of leftovers. This recipe is more inspirational than it is instructive. There’s really not a lot to it, but I want to inspire you all to face your fate with leftovers, and make each days ingredients more delicious than the previous. The key to keeping the same ingredients from becoming boring and monotonous is in the dressings. Chutneys and dressings instantly transform a meal and are the quickest thing to make. Each day after Christmas, experiment with different dressings, jams, chutneys and slaws to ensure the sight of sprouts and chestnuts doesn’t make you want to eat your stocking. This is one of those recipes that is so easy it feels like cheating. Simply choose your ingredients (or find whatever you have leftover in the fridge) and combine them all nicely in a bowl. Start by arranging the leaves across the base of the bowl and then build it up with the meat and vegetables. You can also add pulses, nuts and seeds if you have them. For the dressing, place all of the ingredients into a blender or food processor and blend until smooth. Transfer to a bottle or a jug and stir continuously, adding a little more oil or water to thin it, depending on how you prefer the texture. Drizzle the dressing over the salad and either serve like that, or take a few minutes to coat the salad ingredients in the dressing, tossing and mixing the meat and vegetables with your hands. Top with chopped nuts and seeds (even tastier if you toast them in tamari) and enjoy. I am no vegetarian, but this nut roast… it’s quite something. Something - perhaps not something to replace the turkey and ham that’ll sit atop my table this christmas - but something never the less. I have never made or even eaten nut roast, so this was quite a blind baking session for me. I didn’t really know what it was supposed to taste like, or even look like, and it certainly isn’t the most beautiful thing you will ever make, but it is delicious. At least, this version is, even if i do say so myself. Nut roast doesn’t look or sound particularly appealing, and although it is a traditional vegetarian option when it comes to roast/christmas dinner, it is very underrated in my opinion. It is just as delicious and flavoursome as stuffing is, and isn’t dissimilar in taste or texture, but the beauty of this nut roast is that it is crammed full of vitamins, nutrients and plant-based protein. Most nut roasts (and stuffings for that matter) are bulked out with breadcrumbs and flour, which can be strenuous on your digestive system, especially if you suffer from a wheat or gluten intolerance. These ingredients make the nut roast extremely bland and stodgy, so I wanted to rework this vegetarian crowd pleaser into something that would actually please a vegetarian, and a non-vegetarian for that matter. My recipe uses cooked quinoa and ground almonds instead to bind the vegetables, nuts and seeds, which are not only easier to digest but also exceptionally higher in protein, fibre and valuable nutrients. As the name suggests, nut roasts involve a lot of nuts. However, although nuts are incredibly nutritious and a great source of protein (particularly for vegetarians who can sometimes find it hard to get enough protein from their food), too many can also cause complications within the gut. For that reason, I have reduced the amount of nuts in this recipe, and increased the amount of vegetables. + You can experiment with your own combination of vegetables, nuts, seeds and herbs in this recipe, and the great thing is that the more you add the better it tastes. I’d recommend prioritising the sweet potato, chestnuts, ground almonds and as many herbs as possible, as these are the foundations that make it all come together, but other than that, add what you like! Serve this as a vegetarian main, a vegetarian stuffing alternative or as a side to accompany meat dishes if you are feeding meat-eaters. It also makes the perfect starter as it isn’t dissimilar to seed & nut bread, so is brilliant with chutneys, soups, cheeses or as part of a canapé spread. I baked mine in mini loaf tins, serving one per person alongside the mains. Start by blending the sunflower seeds, half of the pumpkin seeds, the herbs and the chickpeas in a blender or food processor until they resemble a bread crumb consistency. Transfer them into a large bowl and set aside. In a frying pan, sautee the onion, garlic, brussels and chestnuts in ghee, olive oil or coconut oil. Add the tamari and lemon juice and sear until the vegetables are completely soft. Place in a bowl then add the ground almonds chopped nuts eggs etc all flavours. mash and knead into a ball. press into a tin and bake. Meanwhile, measure all of the other ingredients, apart from the egg, into the bowl with the ground seeds and herbs. When the vegetables are soft, add them to the dry ingredients and mix with a wooden spoon, mashing the ingredients with the back of the spoon to combine them. In a separate bowl, beat the egg and then stir it into the mixture thoroughly. When all of the ingredients are combined, press into a greased loaf tin, mini loaf tins or a muffin tray, to make individual single serving portions. Alternatively, to make canapés or to make vegetarian stuffing, form into 2 inch balls. Bake for 45-65 minutes, depending on whether you are baking a large loaf, or smaller individual ones - which will take less time to cook. Place all of the ingredients apart from the chia seeds into a large saucepan, and simmer on a medium heat. Once the chopping and dicing is out of the way, chutney is easy work. Leave it to simmer and soften, checking occasionally to make sure there is enough water in the pan. Keep topping it up with cold water if the fruit begins to stick to the bottom of the pan. After about 20-25 minutes, check the fruit to see if it is soft enough. Add a little more water, then remove from the heat, transfer to a blender and blend for 5 seconds. If you prefer your chutney chunkier, don’t blend it. Pour into a bowl, jar or airtight container and stir in the chia seeds. Let sit for a few minutes, stirring occasionally, and when the chia seeds have swelled slightly, seal the container and store in the fridge. Serve with the nut roast, or spread an even layer over the top and sprinkle with herbs or crushed chestnuts to garnish. Simply mix the ingredients together in a small bowl, or use a blender for a smoother result. Serve as a dip, or thin with a little water and serve as an optional dressing to drizzle over the nut roast. + This dressing is wonderful on salads too, and instantly transforms tasteless salad leaves and vegetables, making them creamy and delicious. Serve with Celeriac Brazil Nut Slaw. I first tried a hot toddy at a festival in Wales, in a tent, at a temperature below freezing. One sip and I soon forgot about my frozen feet and was in perfect harmony. This recipe does’t call for alcohol but as it’s christmas, you should feel very free indeed to add it in yourself (rum, whiskey or bourbon). This recipe is an excellent remedy for the winter months, containing immune boosting orange and medicinal ginger. One essential piece of advice for staying healthy this time of year is to always have a drink with you. Drink plenty of water to keep hydrated and hot, herbal teas to keep you warm, as well as fresh herb and spice concoctions to cleanse your body, nurture your immune system and flush out any toxins. If you have a cold or a sore throat, this recipe is soothing, warming and healing and promises to get you back in good health immediately. The cayenne pepper may seem a little outlandish, but this spice has been used for generations in treating ailments, such as flu, colds, migraines, headaches, heartburn, sore throat, tonsillitis, nausea and much, much more. It is an incredibly cleansing and detoxifying ingredient, so to get the most out of your toddy, be sure to include it. It is also known as a circulatory stimulant, which heats the body and kick starts the digestive system. Combined with honey, lemon and ginger, this drink is the ultimate detoxifying beverage, perfect to keep you functioning throughout the winter, or to relieve symptoms you may already be experiencing as an effect of the cold weather. This winter, I have become reacquainted with porridge - a traditional breakfast option popular across the nation, but so underrated in my opinion. For me, it's not about the porridge (that's just oats and water, or milk at its best). It's about the flavours and the toppings. I have experimented with grains (using my favourite psuedograins like quinoa, amaranth and buckwheat), dairy free milks (which make it a hundred times creamier than water), fresh spices and herbs (i love cardamom or rosemary and basil) and toppings, such as fresh berries, compotes, almond butter sauces and much more. Today I decided that, seeing as it was nearer lunch time than breakfast by the time I woke up, i would have a go at savoury porridge. I used to be obsessed with risotto, and was eager to make a simpler, easier variation of it using gluten free oats. At lunch time, it's harder to find time to spend on cooking, and conventional risotto involves a lot of preparation and a lengthy cooking time. Here, I used a few of my favourite autumnal vegetables such as sweet potato and jerusalem artichoke. The artichoke brings a richness to the recipe and the sweet potato provides the perfect texture, and subtly sweetens the dish. + Perfect as breakfast, lunch or dinner, and delicious enjoyed hot or cold. Make extra and chill or freeze the leftovers for later on in the week/month. Start by cooking the oats. In a large saucepan, heat the oats and the water together. When the oats begin to plumpen and the water is dissolving, stir in the coconut milk and the sweet potato. I prefer using steamed sweet potato, but grated with create just as much flavour. The cooked sweet potato makes the porridge thicker and more creamy. Stir the porridge constantly to break down the large chunks of sweet potato, and add more water if you think it is needed. Add the grated jerusalem artichoke, dill, rosemary, nutritional yeast and tamari, along with any of your other chosen ingredients (peas work well for a filling lunch dish). Simmer for 10-15 minutes, adding more water or milk as you think is needed. The porridge should resemble a risotto more than a porridge, due to the thick, creamy sweet potato sauce. My first and only experience of pumpkin pie up until now was at my best friends house around the age of 13. With an american father, Thanksgiving is a big deal in their house, but I’d never really celebrated it before. At an awkward age of growth spurts and secondary school I almost didn’t even try the pie and tried to turn down the offer politely. It didn’t look especially appealing and i’d never tried it before, so naturally assumed it couldn’t be that special. Thankfully, her mother persuaded me and just one mouthful of that warm, homemade pie has remained a vivid memory in my mind ever since. I think a section of my brain is dedicated entirely to food, and times or occasions associated with certain foods. Sometimes i can even remember a conversation or event simply because i remember the food we were eating, or the restaurant we were in at the time. I can still see that pumpkin pie, fresh out of the oven, sitting on the countertop and can still smell the warmth of its spices. The sheer brilliance of pumpkin pie makes me wonder why it has taken me this long to attempt it myself. It is brilliant enough made with cheap pre-made pastry or shop-bought in festive packaging, but is even more brilliant if you make it by hand, with fresh pastry, and make it without any unnatural ingredients. So if you like that cream, the sugar and the buttery base, look away. You’re not going to like this version. Well, you’re not going to like the sound of this version, but if you do decide to trust me, you’ll realise it tastes just the same, if not better, than what you’re used to. Before changing my diet i enjoyed baking brownies and rice crispy cakes on a regular basis - in fact, so often that i knew the recipes backwards, upside down and read with my eyes shut. I’d mastered two very amazing recipes, and they were easy, so making a pie seemed like an impossible task - some kind of art form i was certainly incapable of and which was definitely out of my league. But since i now use vegetables in baking and know how to make pastry with nuts and without gluten, I felt it was about time i revisited that moment in my best friends kitchen, embraced this seasons most delicious ingredients and made that classic holiday favourite, with a lot of things taken out, but with a whole lot of other good things added. It’s hard for me to remember exactly how mama coleman’s pie tasted, but to me this one is all that a pumpkin pie should be. The base is different, as it is not real pastry. It is made without butter and with no flour - just nutritious nuts and nourishing coconut oil. Where most pies (especially shop bought pies) taste smooth and artificial, the base of this pie is crunchy, nutty and flavoursome. The filling is amazing, especially for people who are intolerant to gluten or just generally don’t desire the feeling of fullness that comes as a side effect of eating cakes. The filling is so smooth and light and, made with coconut oil and coconut milk, is a kind of creaminess you just can’t find in normal, artificial desserts. If theres one thing you make this winter, let this be it. Far better than chocolate, far better than mince pies and far better than the pumpkin pie you had last year. With this recipe, you can have your cake/pie/cheesecake/vegetables and eat them, all at once. Blissfully unaware that you are eating your way through the holidays to a healthier New Year, thanks to all the vitamins and minerals in pumpkin which will keep your immune system in check this winter. Eat up, it’s basically medicine. You neeeeeed it. Start by roasting the pumpkin for the filling. Remove the skin and place in a roasting dish with a little splash of olive oil or some coconut oil, and roast for 25-35 minutes. It needs to be as soft as possible. Once the pumpkin is cooked, reduce the oven temperature to 160c. Blend the nuts in a food processor or blender until they become a fine flour consistency. Pour into a medium bowl and add the flour, salt, vanilla and cinnamon. Mix together with a wooden spoon, then add the coconut oil, combining with your hands. The mixture should begin to form a dough. Make the dough into a ball and it should hold its shape. Take a round baking tray or cake tin, roughly 20cm in diameter (you can also use a rectangle dish if you don’t have a round one) and grease the bottom and the sides with a light coating of coconut oil. Press the dough into tin, making the base no more than 1cm thick, and making sure to press the dough around the sides too. Use a fork to pierce the dough in the middle, and bake for 15 minutes, until it begins to brown, and until it is dry to touch. Whilst it bakes, make the filling. + TIP: Pumpkins with paler skins generally taste nicer and have a smoother less stringy texture when cooked. Look for crown princes or any with a greyish/blueish skin. Take the cooked pumpkin and place it in your blender or food processor along with the rest of the filling ingredients. I strongly advise using the egg and also maca if you have it, as the egg provides a vanilla-y flavour and a smooth texture and the maca adds an incredible malty caramel flavour. Blend all of the ingredients together until the mixture is smooth. Add a little more coconut milk or oil if the mixture needs help getting smooth. When the base is cooked, leave to cool for 5-10 minutes and then pour the filling mixture into it. Spread the filling evenly across the pie base, ensuring it reaches the sides too. Return to the oven and cook for 40 minutes, until the middle of the filling is firm to touch. If it is still quite wet or gooey to touch, leave it to cook for a little longer until you can be sure it is cooked through. The top should begin to brown and crack a little, and you should be able to stick a knife in the centre and bring it out clean. Let cool for at least 20 minutes. I prefer it from the fridge as the filling becomes a wonderful consistency, but it is also delicious enjoyed warm. Serve with coconut yoghurt or coconut cream, fresh berries or a warm berry compote. Pumpkin seeds also carry a lot of nutrients, so don’t throw them away. They are high in protein and fibre and also contain tryptophan which is a chemical compound that triggers happiness and positivity and reduces stress. Pumpkin seeds also contain anti-inflammatory properties and essential vitamins and minerals. Toss them in coconut oil or olive oil and your choice of natural sweetener and spices, or use nutritional yeast, tamari and dried herbs and spices to make a quick a savoury snack. I am excited to announce that next weekend i will be popping up and taking over Blend and Press in Neals Yard. I will be running an exclusive Model Mange Tout brunch menu, and i will be there from 10.30-1.30pm. Pop in and say hi, and choose from my nutritious gluten, grain, dairy and refined sugar free menu. I will be serving Cacao Chia Porridge with Almond Sauce and berries, Sweet Potato Cashew Pudding with Christmas Qnola, Cranberry and Rosemary Compote and Toasted Chestnuts, and Buckwheat Pancakes with Coconut Cream, Tahini and Cacao Sauce. Prices start from £4.95. Hope to see you there! Come in, keep warm and wake up well! November is here and, like most November’s, you’re probably cursing its premature arrival, certain that we should still be in October. November is a stressful month for many reasons. The weather gets colder, the days get darker, christmas gets closer and before you know it, the year is already over again. This means more colds, more early nights, more last minute shopping and get-together plans and more New Years Resolutions. It depends which way you look at it. Let’s forget all of that for a moment and think about the fact that food has never tasted so good, duvets have never felt so comfortable and staying in is far more enjoyable than going out anyway. This is the perfect time to wrap up indoors, to get creative with this seasons most nourishing foods and take time to make truly great food for you and your loved ones. Autumn is one of my favourite times of the year in terms of fresh produce. Everything is so hearty, earthy and flavoursome and I love cooking with soft vegetables and soft fruits, making everything into warm, nourishing concoctions. Now, although the weather is unusually warm for this time of year, there is still a sense of urgency to rush into the house after a long journey home and slam the door in the face of darkness. I mean, I started my journey home from one part of London at 3pm the other day and by the time I’d gotten back over ground, it was pitch black. The nights are chilly and the darkness makes me feel like we are living under some kind of winter blanket, even though I’m not wearing gloves yet. All I want to do is get into the kitchen and straight back out of it so I can enjoy some wholesome, homemade food from the comfort of my bed or on the sofa. There is nothing more soothing than a bowl of steaming goodness, like a hearty soup, a thick, creamy risotto or nourishing stew. And with any one-pot recipe, you can just keep adding to it. You can add spices and herbs, homemade stock or broth, spinach or kale that may look like it’s seen better days. In a one pot, everything combines into a unique amalgamation of flavours, food groups and most importantly, nutrients, so cram as much in as you can, and be sure to make enough for leftovers for times when hibernation seems more appealing than cooking. This recipe is similar to my Crown Prince Quinoa Sotto - something I made over a year ago now, when I first started this blog. This recipe is quicker and easier though, as it doesn’t require cooking the sweet potato or pumpkin separately. You literally add everything to one big pan and let it all simmer together. Risotto was my favourite meal before i changed my dietary habits, but it always made me feel uncomfortable afterwards - too full to move and not especially nourished. This recipe doesn’t use cream, cheese, butter, sugar or processed risotto rice like most recipes do. It uses coconut milk, fresh herbs and quinoa, making it high in fibre, protein and low gi sugars, and low in starchy carbohydrates, grains, gluten and dairy (absolutely free from them, in fact). Enjoy playing around with this recipe, as there is always room to add more. I always add greens like spinach, diced broccoli or grated courgette as they cook down and become so soft you hardly notice them. Start by making the quinoa as this is your base. Use a large saucepan leaving space for you to add and build, and cover the quinoa in twice its amount of water. Bring to the boil and then reduce the heat and leave it to simmer. In a blender, blend the chickpeas, lemon juice, olive oil, cumin, garlic and 2 tablespoons of the tahini until smooth. This is a quick houmous recipe which adds a delicious creaminess to the sauce. You can also use shop bought organic houmous if you have it. Once smooth, set aside. When the water is draining away from the quinoa and it is more or less cooked, add the 1/2 cup water, the coconut milk (solid and liquid), the cannellini beans, grated sweet potato and fresh herbs and stir to combine. Keep on a low-medium heat, stirring constantly and adding water or plant milk if the mixture is becoming too thick. Add the salt or tamari and the nutritional yeast, then stir in the houmous and coconut oil. Stir constantly with a wooden spoon, adding your extra vegetables of choice. When everything is soft and all of the flavours have simmered nicely together, remove from the heat, season one last time and serve. I like to serve mine with a dollop of coconut milk or cashew nut cream, or sprinkled with baked basil or kale chips for extra crunch. My Savoury Qnola, which will be available in the New Year, is also delicious on top. It’s soup season. We are so far into soup season it hardly seems like i will ever eat anything other than soup again. I've almost forgotten that food exists in its solid, fresh and raw form - this soul food has taken over my kitchen and nothing makes it onto my plate or bowl without passing the blender. This soup is incredibly high in antioxidants and is alkalising and soothing to the digestive system. Deep red vegetables contain phytochemicals which are substances found only in plants that help fight disease. Tomatoes and red peppers are essential to health and are high in lycopene, a phytochemical that helps reduce the risk of several cancers. It is important to incorporate a multicoloured mixture of fruit and vegetables into your diet, as each different one contains different antioxidants, vitamins and minerals, which in turn provide their own different benefits. Getting a mixture of fruit and vegetables into your diet will mean your body receives a mixture of benefits. Some vitamins and minerals are even known to be more easily assimilated and absorbed by the body when consumed alongside others. Roasted Pumpkin Seeds, to top. Preheat the oven to 170c. Pierce the skin of the tomatoes several times and chop the pepper roughly then place on a baking tray and drizzle with olive oil, sesame oil or avocado oil and salt. Place two cloves of garlic on the baking tray too and roast for about 30-40 minutes, until the vegetables are soft. Meanwhile, halve the cherry/baby tomatoes and heat them in a saucepan to simmer them into a thick sauce. Add a little oil and water and simmer until the tomatoes are broken down and begin to resemble a paste. Remove the large tomatoes and the red pepper from the oven and place the vegetables in a bowl of cold water. Now do your best to peel the skins off - otherwise your soup will be bitty. Melt the coconut oil in a large saucepan over a medium heat. Pour in the chopped tomatoes and then add the roasted vegetables and garlic, the sumac, chilli, nutritional yeast, ginger and lemon juice and stir until combined. Add the coconut milk next; i used a little less than the entire tin and used the leftover in a smoothie, but add as much or as little as you want depending on how thick, rich or creamy you want it to be. Bring to the boil momentarily and then reduce the heat back to medium, or a little lower. Simmer for about 30 minutes. Let cool briefly once everything looks soft and like it has amalgamated. Transfer into a blender and blend until smooth. You can leave it unblended if you want a chunky soup, or just blend it for 1 minute if you want it somewhere in the middle. Season with salt and pepper or tamari, and drizzle with olive, sesame or avocado oil. Enjoy with rye bread (toasted twice) or my popular Miracle Bread and top with a spoonful of solid coconut milk and toasted nuts or pumpkin seeds.